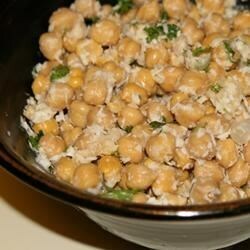 "Garbanzo beans get a lift when tossed with grated coconut, fresh cilantro, and lemon juice. Serve this salad alongside your favorite curry or at your next barbeque. My mom made this all summer long!" Combine garbanzo beans, coconut, green chile peppers, and cilantro in a large bowl. Stir in lemon juice, and season with salt. Refrigerate for 2 hours before serving for best flavor. A quick-and-easy Greek salad with garbanzo beans and a zesty dressing. Frozen, grated coconut in available in many Indian markets. I make this salad most of the days.But I use less of coconut and add other vegs like cucumber,carrot pomogranate seeds etc.This way it tastes better. chhaya. VERY GOOD!!! Quick, simple prep, just a few ingredients, tastes great. What more could you ask for?